So, it’s been pretty quiet around here. Not because I haven’t been thinking about you, lovely readers, but because God has been showing me some new ways to invest in the women God has placed directly in my life. A few weeks ago, we hosted a fall kick-off event at our church, and I thought you might like to see some of our ideas. You’ve heard me say it before: our church is new (technically called a church plant). That means we are small, but gradually, the Lord is bringing new women to us. 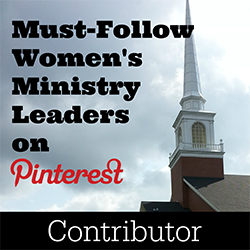 During the past year, we’ve discovered one of two things about some of these women: they have a limited biblical background and/or a desire to make disciples but don’t know where to start. Either way, our church has been presented with an pressing opportunity to pour into the lives of these women and train them to be reproducing disciples. 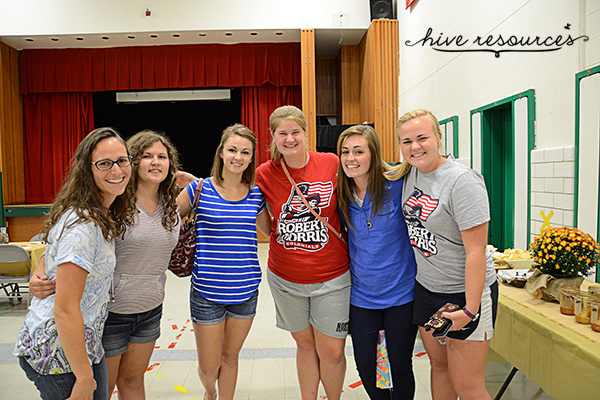 So, our fall kick-off event wasn’t just a time of fun, food & fellowship. 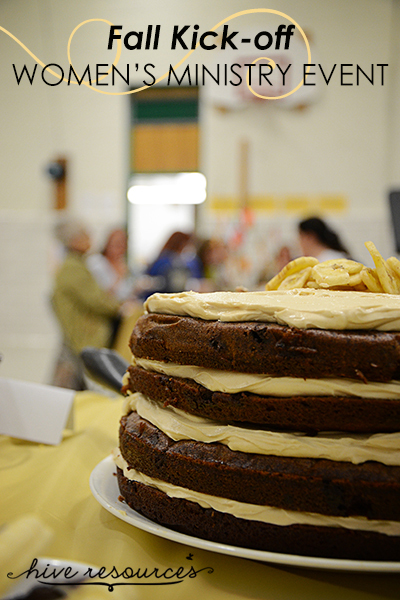 Although, there was cake there (see glorious exhibit A in the photos above), this women’s ministry event was part of a greater strategy we’re implementing to disciple women. We used the fall kick-off as an “entry event,” where we outlined the various discipleship opportunities we’re offering this year (I’ll be sharing more about those on the blog later). Then we asked the women to respond or register for the opportunities using this cute Ball Jar response card (see photo above). The response was overwhelming! 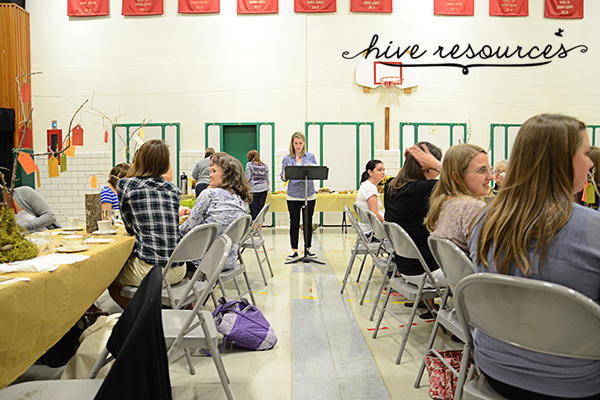 Almost every woman in attendance expressed a desire to be a part of our discipleship emphasis. 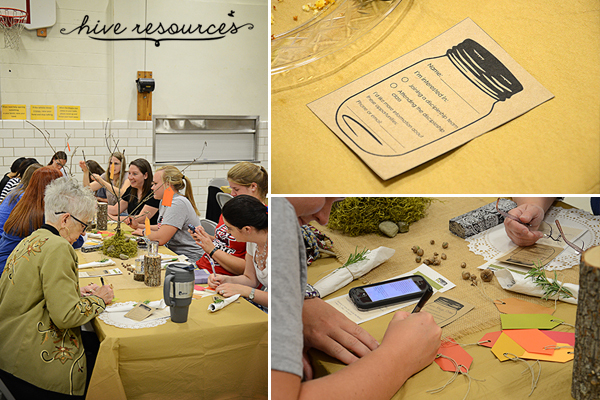 As a first step toward learning how to disciple, we decorated our tables in meaningful ways. My friend, Julie, helped me assemble these lovely little tree centerpieces using this tutorial (on pinterest, of course). We called them our Prayer Trees. 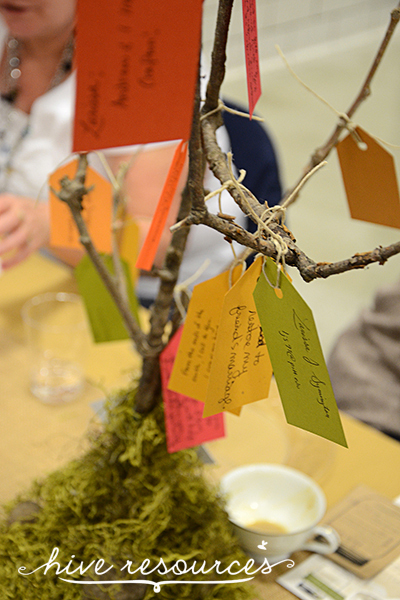 When the ladies arrived, the trees were bare, but they sprouted lovely fall colors as we asked the women to write various prayer requests (including their contact info) on paper tags and then hang them on the tree. Each centerpiece included instructions and ideas for what to write down. Before the women left, we asked them to pick up our version of a Jar of Clay and to select several prayer tags from the tree. The jar would act as a prayer jar to be put in a visible and accessible spot in the home, where the women could pray over the requests. To make the tags, I used this Ball jar free clipart and added our theme verse from 2 Cor. 4:7. Next, I printed it out on craft paper and tied a tag to each jar using twine. 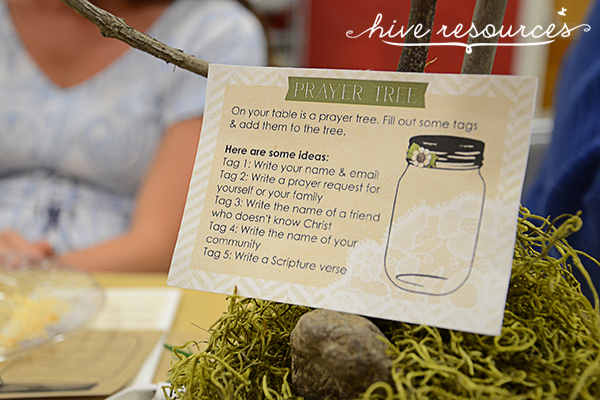 It was such a joy to see the women fill their little jars with requests from our prayer trees. And because many of the prayer requests included the petitioners’ contact info, the women were able to contact those for whom they prayed to encourage them. Since our event, I’ve heard reports of ladies receiving texts, phone calls, and handwritten notes of encouragement from those who are praying for them. What a sweet testimony to Spirit-led fellowship, modeled for us by the early church in Acts 2:42. As the early believers prayed for each other (among other things), they were granted favor in their community and God added to their number daily. A true picture of what it means to be a Jar of Clay! 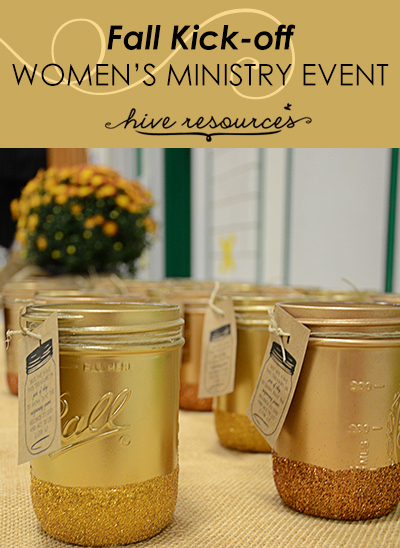 It is our hope that the women who come through our doors will be equipped to become intentional Jars of Clay. 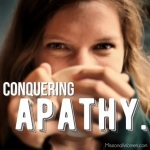 We don’t want pretty decorative teapots filled with lots of knowledge about the Bible or sitting pretty on church pews, but rather, women who are filled with the treasure of the gospel and stand ready to pour out their lives for others in Spirit-led ministry. We’ve seen glimmers of this the past few weeks and it is encouraging! To God be the Glory! 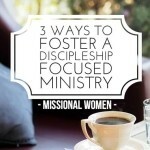 What role does women’s ministry play in your church’s discipleship strategy? 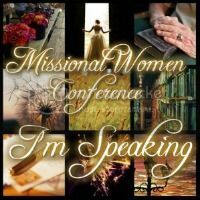 How can you make your women’s ministry more missional? I’d love to hear your feedback in the comments as we continue to develop our own strategy. Sooo awesome!! Feeling very inspired… thanks so much!! Thank you for the great idea! Bless your ministry! Thank you for charing your ideas with us. 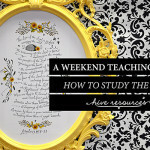 I’m starting a women’s discipleship in my church and your ideas will help Me a lot. We would love to duplicate your event. Would it be possible for you to email me the printouts in pdf or jpeg? Are there any instructions on making the jars gold? Love this idea!!! Thanks a million! Hi Teresa, I didn’t post a tutorial. We spray painted the jars with metallic spray paint (there are a variety of golds you can choose from) and waited for them to dry. Once they dried, we brushed modge podge glue on the bottom half using a regular paint brush. Then sprinkled extra fine glitter on the glue. It is best to work in sections so that the glue doesn’t dry too quickly before you can add the glitter. This is a pretty messy craft, so ensure that you work in a well-ventilated area! Oh I am totally stealing this idea!! Can’t wait to offer this idea to my ladies. After 3 years of leading our Women’s ministry, with lots of successes and a few “failures”, I’m always looking for new ideas that will entice the ladies to attend. This idea is very inspirational. We are doing a fall kick-off and our church is in need of lots of prayer. This is a wonderful idea, thank you for sharing. 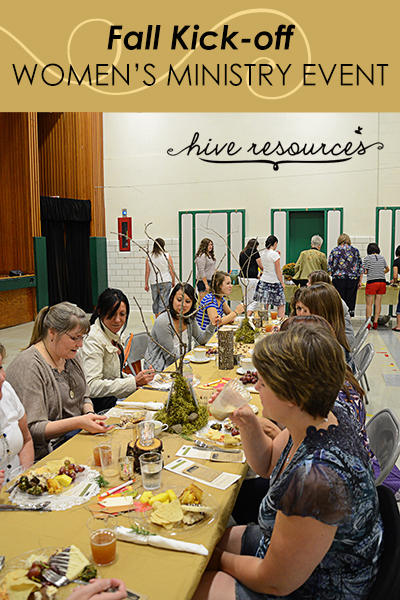 You have a wonderful gift to share with Women’s ministries around the world. I’m so glad I stumbled upon your site. May God continue to bless you! I love this idea, the ladies at our church would enjoy it so much, especially coming back from vacation and trying to catch up with each other. Can you send me the printouts in JPEG or PDF that you made? That would help me so much, Thanks! What a beautiful idea. Would it be possible for you to email me the printouts in pdf or jpeg? I WOULD LOVE TO RECEIVE IN PDF , YOUR LABELS AND SUCH , I AM TAKING OVER WMU DIRECTOR IN A MONTH AND I HAVE NO EXPERIENCE , THIS WOULD BE AWESOME !! I will look to see if I still have these. There is a possibility I may not have them as I’ve changed computers a few times since this post! Thanks for stopping by!